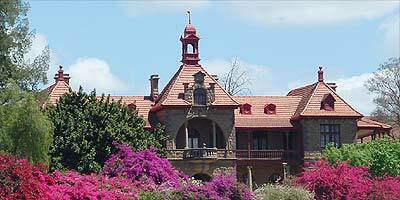 In 1850 William Edmeades came with his family to settle on the farm Zeekoegat close to the Olifants River near Oudtshoorn. The eldest son, George Mason Edmeades, started his career as a painter in Oudtshoorn. In 1860, after the death of his father, he took over responsibilities for the family. He was a shrewd business-man and in 1863 had his own shop, Smithy, a wagon-building firm in Oudtshoorn. As his other five brothers grew up, he took them in as partners. One of the brothers, Edwin T.L. later became a well-known farmer, member of the Town Council, Mayor, member of the Divisional Council and candidate for the Legislative Council. In 1911 he decided to build a double-storeyed villa residence on plot 365 in West Bank. Mr. Vixseboxse designed the villa in the Dutch 'Transvaal' Neo-Renaissance style. The tender of Mr. A. Rogers for the erection of the building was accepted and Vixseboxse acted as Clerk of Works. Mr. Edmeades personally supervised the work to make sure that every task was carried out to perfection. Noteworthy is the reddish purple sandstone that was used for the key pattern cornerstones and window sills that form a constrast to the lighter grey tint sandstone of the walls. Vixseboxse's design for Pinehurst differs from those of Bullock and other architects of that period in that he made very little use of cast-iron pillars and brackets. This is clearly to be seen at Pinehurst. The balconies rest on sandstone doric pillars while the balcony railings are of carpenter's lace teak-woodwork. The brackets to the balcony pillars and pillars are of teak and pinewood respectively. One of the main features of the interior of the house is the four beautiful sandstone/teak fire-places. 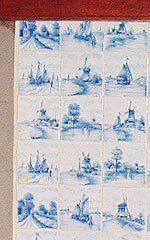 Each one of the fireplaces is decorated with 108 delft tiles with 17th and 18th century merchantship and windmill designs. The other fireplaces are of white, white-and-black marble decorated with colourful green and yellow tiles with variations of the French lily in the Art Nouveau. Brass decorated plates add to the beauty of the fireplaces. The floors of the main entrance hall and corridors are covered with parquet flooring wood tiles of teak and oakwood. The ceilings of the residence are of pine in contrast to the pattern pressed paper mache and steelplate of most of C. Bullock's designs. In the interior of the building selected teak, yellow-wood and oak were used for the staircase, doors and wall panelling. Very little stained colour glass was used in the windows. The municipal valuation for the residence in 1912 was £10 000. In 1926 the Edmeades family sold Pinehurst to the Public Works Department to be used as a Training College hostel for ladies. 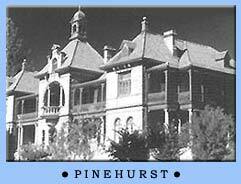 After completion of a new ladies' hostel next to the College it was made part of the new Mens' hostel 'Pinehurst'. The building was declared a National Monument in 1966. The Karoo Desert National Botanical Garden is the only dedicated succulent garden in the Southern Hemisphere and on the African continent.